Home restaurant pos software Why update your Restaurant POS Software in 2019? Restaurant management is not an easy task. It takes a lot of time and efforts from the restaurateur to manage all the operations effectively. The whole world has been updated these days, and it is essential for restaurants to incorporate different types of technologies into their daily operations. As a restaurateur, you need to hire a team and manage it effectively, you should provide high-quality food which is right in taste, quantity, and quality, should keep up with the latest trends in F&B industry, should be able to contribute in time delivery to the customers, etc. Apart from managing all these things, you should be able to bill as quickly as possible, file the taxes, manage the inventory and payroll, etc. It is not easy to control the myriad of tasks by oneself and to depend on your employees for all these things isn’t going to make them any easy, and the old POS systems aren’t much efficient. This is the situation where you have to update the restaurant POS software. If you have been stuck at age-old POS software for your restaurant, it isn’t going to do any good. Here are some of the questions that you have to ask yourself about your existing POS software. Are your routine POS operations taking more time than it used to make? Are the customers of your restaurants are waiting for more time after taking the meal due to POS? Has it become difficult for you to train your new employees about the latest POS system? Do the payment authorizations fail? Do any legitimate payments getting rejected? Are you spending more time troubleshooting the POS in the middle of a working day? Does your system has any glitches and changing the menu, prices are taking longer time or are you unable to change them at all? If your answer is yes for any of these questions, then it is time to upgrade your system. Yes, now is the time for you to update your POS software for a better and reliable option. There are so many features that have been incorporated in the latest POS software in 2019, and it is essential for you to get your hands on this software. 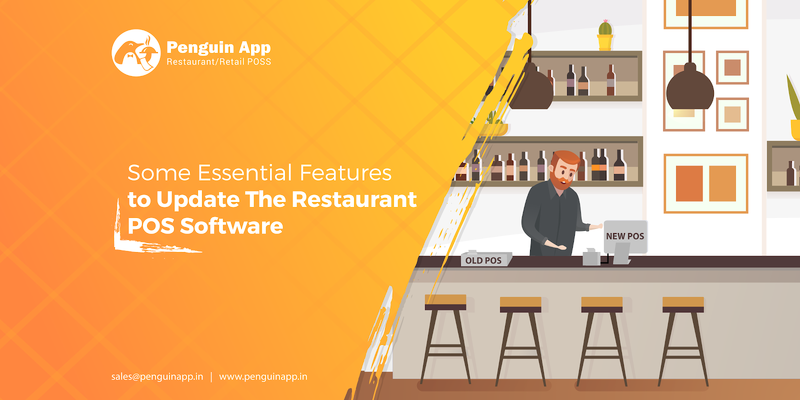 Technology keeps on updating, and there are many other features that you can find in the latest POS for restaurant software. Here are some of the latest features present in POS software in 2019. The POS system is the core of a restaurant, and it is essential for it to function at its best. Some so many people use this software depending upon the type of restaurant, and it is essential for you to give them a pleasant user experience. The restaurant POS software that is perfectly crafted will come in handy in various situations. The functionality of the software plays an important role here, and you should upgrade your POS system to the one that will be perfect for you in the long run and can be used on a day-to-day basis without putting in many efforts. Many guests who visit the restaurants love the customization option for the food orders. There are so many people out there who are allergic to some products and who don’t like certain ingredients; these guests usually customize their orders as they like. In such situations, the POS restaurant software should be capable of customizing food orders completely. You can add on some ingredients and personalize the food items according to the will of the customer. Taking the customized orders can become tiresome if you do it manually and with POS software that can document everything, the process will become easy, and you will be able to deliver your customer with the product that they want without any confusion and efforts. The latest POS systems aren’t only confined to billing. They are capable of providing an overall best meal experience for the customers. From the start to an end of the meal, they can create a more significant impact on the customers. The modern POS restaurant software can take the order of the customer, customize it as per their requirements, send the order to the kitchen, notifies the waiter when the food is ready and at the end collects the payment from the customer. In the back end, the same software can be used for inventory and payroll management too. Every operation of the restaurant can be streamlined with the help of the modern POS system. For any business, assessing performance is very important. It is mandatory to know about the business and its performance from time to time. The modern POS systems can track the day to day activities of a business and provides the required data whenever required. The insights and data provided by POS systems are very accurate and impactful for the entire business. In any business, security plays an essential role. Also, if you are apprehensive about POS security problems, we understand that worry. After all, your clients rely on you with specific personal data, and you depend on us to keep it all protected from harms. The latest POS systems provide high security for your data. You can store the required information in the cloud and access it whenever needed. The software provider will equip you with reliable security. These are some of the features that you can find in the upgraded software. It is essential for you to get the best restaurant POS for better overall management. The technology has been improved a lot lately and getting your hands on the latest POS software which is incorporated with modern features will aid your business a lot.